This “reconstructed” berry pie is a simple play on a traditional favorite. I love macerated berries in the summertime, and who doesn’t like a good berry pie? This dessert takes half the work and a third of the time as a normal berry pie, and by rethinking its structure, allows you to keep your berries moist in a delicious simple syrup while keeping your crust crisp and flaky. Served in a martini glass, this recipe will make you a star at your next summer get-together. Combine quartered strawberries, blackberries and blueberries in a mixing bowl. Chiffonade the basil leaves into very fine strips. Add chiffonade basil, sugar and fresh-squeezed lime juice to the berries. The sugar should evenly coat the berries, while the lime juice brings the sweetness of the sugar into balance. We use a simple 3-2-1 pie dough made popular by Michael Ruhlman’s book Ratio. Using this (metric) ratio allows you to scale the dough recipe up and down as needed, measuring your ingredients by weight for accuracy. Place the flour in a food processor with a pinch of kosher salt and add cubed butter on top. Pulse a few times so that the butter and flour slightly start to incorporate. Slowly stream in ice cold water while hitting the “pulse” button (the secret to a flaky pie crust is having large, whole chunks of fat dispersed throughout the dough mixture). Mix dough quickly and just enough to incorporate all the ingredients but stop before it comes completely together. Turn dough out onto a clean countertop and immediately squeeze into a ball. Wrap in plastic and chill for 15 minutes (this will keep the butter from melting too much during the rolling process). Lightly dust work surface with flour and roll out the dough to a thickness of about a ¼-inch. (Anything thinner and the dough won’t flake properly when baked.) Roll the pie crust around a rolling pin and transfer to a sheet tray. Crack two eggs into a mixing bowl and beat briefly with a fork. Brush egg wash on top of the crust, sprinkle with some fleur de sel (or other sea salt) and bake in a 375º F oven for 25 to 30 minutes or until the pie crust is a rich golden brown. For the final plate-up, use either store-bought whipped cream (if you really must) or make your own by adding four ounces of cream, ½ teaspoon vanilla extract and enough granulated sugar to make it sweet to a mixing bowl. Whisk cream mixture by hand (or in a stand mixer) until firm peaks are formed. 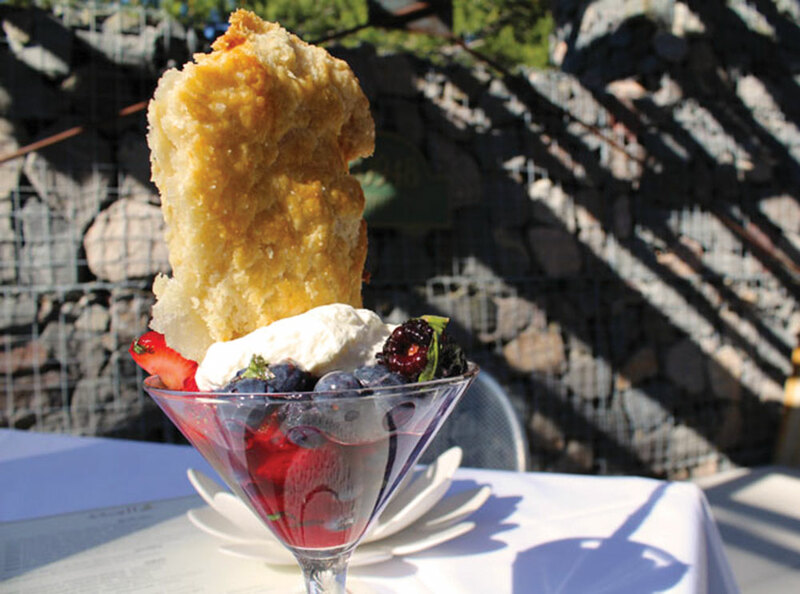 When you’re ready to plate, simply fill a polished martini glass with macerated berries and top with a dollop of freshly whipped cream. Break off a large piece of pie crust and stand up vertically in the whipped cream and berries. Serve immediately.